Marden Henge is one of the largest Neolithic henge monuments in the British Isles, and lies between Stonehenge and Avebury. The earthworks are fairly irregular, and consist of a series of straight lengths rather than a continuous curve. These are broken by two causeways or entrances, one to the north and the other to the east, although the latter has now been questioned as an entrance, and a separate one proposed in the south east. A thick deposit of gravel was recorded on top of the causeway to the south. It was within a slight cut, possible representing a former hollow way, similar to the roadway recorded at Durrington Walls. Coring indicates that the gravel continues and supports the theory that it is part of a Neolithic gravel road way leading from the henge to the River Avon. The river here is only a couple of metres wide but lies in a marshy valley. But this is still the narrowest point of wet ground to cross between the source of the Sarsen Stones near Avebury and Stonehenge if one is looking for a route for their transport. 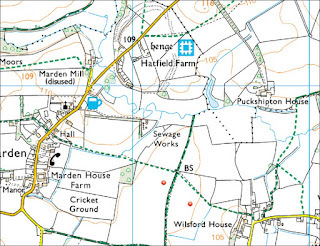 On the other side or south of the river the map shows a bridleway and parish boundary. This lies between the Wilsford Henge and the Marden Barrows. The extraordinary thing about this track is its height above the neighbouring fields. This isn't peaty soil or on a slope, places where you expect the soil to eroded away from tracks, this is on stable clay solis and yet the track is up to a metre or more above the fields. This track doesn't lead anywhere, check the map, so I don't believe it has been made up recently. I can't decide whether it is probably an ancient built causeway or if its height shows it contains the original ground surface of five or so thousand years ago. Either way I would love to see an archaeological trench dug across it. 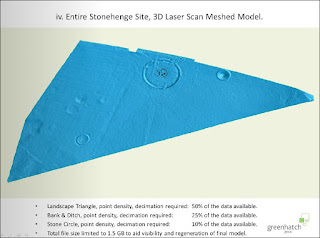 From RESEARCH ON STONEHENGE with added plans. Stonehenge has been the subject of myth, legend and, more recently, of academic research for more than eight centuries. In the 17th century, Stonehenge started to receive royal visits. Prompted by a visit made by James I in 1620, the duke of Buckingham undertook the first known excavation in the centre of the monument. John Aubrey described this later as a pit 'about the bignesse of two sawe pitts', although where exactly he dug and what he found is not clear. James I subsequently commissioned the architect Inigo Jones to conduct a survey and study of the monument. Following Jones’s death the work was completed by his assistant, John Webb, and published in 1655. In this first book dedicated to Stonehenge, Jones argued that Stonehenge could only have been built by the Roman civilisation. The result was a plan of Stonehenge that he believed conformed to the Tuscan order of classical architecture; a geometrical design of four triangles within a circle. As debates continued over who built Stonehenge, a claim for the native British came from a Wiltshire-born man, John Aubrey. By command of Charles II he produced one of the first accurate plans of Stonehenge in 1666, and was the first to record what we now call the Aubrey Holes in his honour. 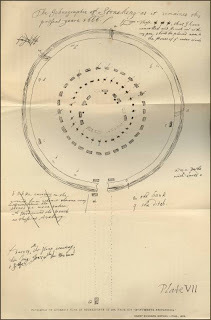 He made comparative studies of other stone circles of the British Isles and was the first person to discover and recognise the importance of Avebury henge and stone circle. He also noted similar stone circles in the more distant parts of the British Isles, which had not seen occupation by the Romans, Saxons or Danes, and logically concluded that they were temples of the native British. He further assumed that 'these ancient Monuments were Temples of the Priests of the most eminent Order, viz, Druids' – the Druids being the only prehistoric British priests mentioned in classical texts. 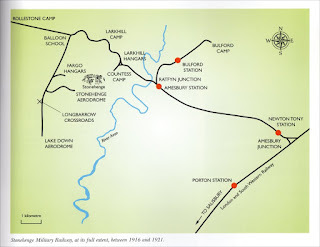 In the 18th century, Aubrey’s pioneering fieldwork paved the way for more detailed observation and recording by the antiquary William Stukeley. He spent each summer between 1721 and 1724 surveying and drawing at Stonehenge and Avebury. He observed details such as the stones of the outer sarsen circle being smoother on the inside and the principal line of the monument being to the northeast, 'where abouts the sun rises, when the days are longest'. He was the first antiquary to observe and record the monuments in the surrounding landscape, such as the Avenue and the Cursus, and to investigate nearby barrows. Like Aubrey, Stukeley claimed that 'we may very reasonably conclude, the elegant and the magnificent structure of Stonehenge was as the metropolitical church of the chief Druid of Britain'. "What I find bizarre is that people keep on repeating wrong dates of the equinoxes and solstices. These days, children – at least in Europe – should learn March 20th as the date when the spring begins. Is that the case? The date is always March 20th. What is the rule? You may see that every non-leap year, the precise moment is about 5 hours and 50 minutes, plus minus 5 minutes or so (the Earth just isn't as regular as you may expect – the irregularities come from the disordered impact of the Moon, Jupiter, and others), after the moment we saw in the previous year. On the leap years, the special moment takes place about 18 hours and 10 minutes, plus minus 5 minutes or so, before the moment we remember from the last year. Needless to say, the increments are roughly +6 hours and –18 hours i.e. +1/4 and –3/4 of the solar day. This agrees with the fact that the spacing between two spring equinoxes is about 365.25 solar days while the civic calendar records either 365 or 366 new dates during that interval. The difference between 365.25 on one side and 365 or 366 on the other side manifests itself as those +6 or –18 hours. Note that 18 hours and 10 minutes above is exactly one day minus 5 hours and 50 minutes; these numbers aren't independent. But you may see that even after 4 years, the timing isn't quite periodic. For example, in 2016, the equinox will arrive 44 minutes earlier than in 2012. In 2020, it will be 40 minutes earlier than in 2016. In average, you may see that every 4 years, the equinox comes about 42 minutes earlier than 4 years earlier. In average, this drift gives you 10.5 minutes per year i.e. 1,050 minutes per century. Because the equinox will be at 3:50 am in 2020 and every 4 years, we will remove 42 minutes or so, 24 more years – roughly in 2044 – the date will jump to March 19th instead of March 20th, Greenwich Mean Time. On the contrary, in 2011, the time was 23:21. So 4 years earlier, in 2007, it was probably 42 minutes later or so, in the morning of March 21st. If you return deeper to the 20th century, you may encounter many years in which the equinox occurred on March 21st. I said that the drift gives you about 1050 minutes per century. That translates to about 18 hours per century. Why is this second-order discrepancy 18 hours? You may notice that it's 3/4 of a solar day again. And again, it's no accident. This new discrepancy arises because the year isn't quite 365.25 solar days. It's a little bit less than that. 365.24219 or so. We deal with this fact by stealing the leap year status from the years that are multiples of 100 (1700, 1800, 1900, 2100), even though they're multiples of four, but we restore the leap year status to multiples of 400 again (most prominently 2000), even though they're multiples of 100 as well. So those 1050 minutes or 18 hours per century occur exactly because once per century – more precisely 3/4 times per century – we remove one leap year i.e. one day (February 29th) again. The times must adjust themselves so that the timing is pretty much the same as 400 years ago. And this is exactly achieved by making the equinox 42+ minutes earlier than 4 years earlier, each four years, except for years like 2100 when it's 18 hours (minus 42+ minutes) later than four years earlier. These required 42+ minutes in 4 years exactly explain why the non-leap-to-the-following-leap-year annual shift was 18 hours and 10 minutes rather than just 18 hours. All these corrections are ultimately calculable from the number of solar days per year, 365.24219. At any rate, if you're teaching this stuff to kids, you should tell them that the spring begins on March 20th, summer solstice occurs on June 21st (although 20th will be increasingly more often), autumn equinox is on September 22nd or 23rd (this will be almost 50-50), and winter mostly starts on December 21st. Those days will be "mostly OK" when these kids become adults." A section was excavated through the henge enclosure ditch terminal next to a proposed south-east entrance. The nature of this was confirmed and the ditch revealed as being originally 2m deep, and a considerable amount of prehistoric pottery, along with numerous antler picks and flint tools were recovered from it. Good organic preservation was also recorded from the lower levels of the ditch. A thick deposit of deliberately laid gravel was recorded on the top of the causeway between the opposing ditch ends. This gravel was sitting within a shallow cut, possibly an earlier hollow way. This may well be a similar feature to the gravel roadway recorded at Durrington Walls, which led from the henge down to the River Avon. Preliminary coring outside the henge at Marden and along any likely route to the river indicates that the gravel continues and therefore supports the suggestion that it is part of a Neolithic gravel roadway leading from the henge to the River Avon. So is this the causeway to the river crossing for the Sarsen Stones? 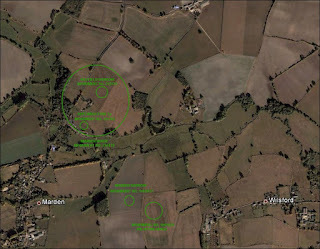 Research Department Report 96/2009 - The Hatfield Earthworks, Marden, Wiltshire: Survey and Investigation which doesn't add much to this aspect of the henge but is very full report on the henge. 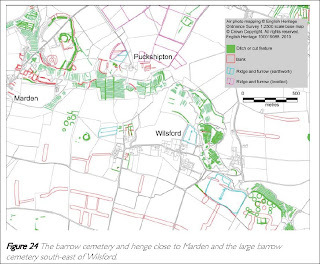 Research Department Report 76/2011 - Marden Henge and Environs, Vale of Pewsey, Wiltshire, A report for the National Mapping Programme is "forthcoming". When we look at the southern side of the river there are more interesting places. On the opposite bank to the causeway there is a dry raised spur which leads to Salisbury Plain. And there is an ancient track and Parish boundary leading down to the river, see the map below. Could this be the track from the henge and causeway? And there is also another henge and a large barrow with a ring ditch (or another henge? )guarding either side of this track. Details of these monuments are below. There is a lot going on. 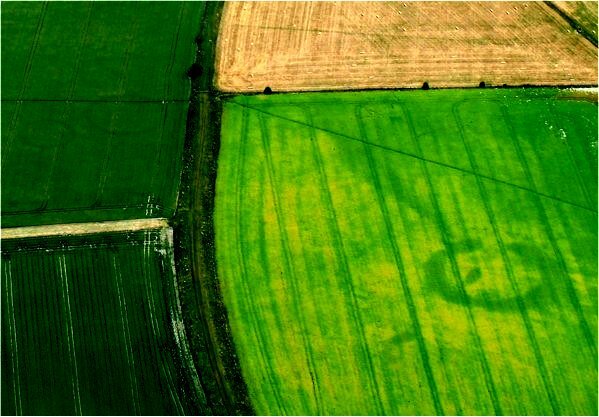 A broad irregular penannular ring ditch, possibly a henge, and pits are visible as cropmarks on aerial photographs. The internal diameter of the enclosure is 43m and the external diameter is between 58m and 65m. The enclosure is defined by a broad and very irregular ditch which measures between 5m and 14m wide. There is an entrance, 12m wide, which faces north-east roughly in the direction of the contour, and towards the river Avon. 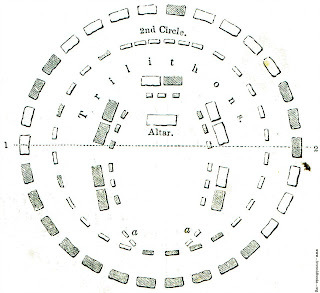 A line of eight pits curves around part of the enclosure, facing the entrance. More possible pits, possibly forming part of a circle around the enclosure, are situated on the east and south sides of the enclosure . Another pit is situated within the south east part of the enclosure. Yet more possible pits, situated between 20m and 70m to the south west of the enclosure, may be associated features. There are a number of potentially confusing geological cropmarks in the area. It is therefore possible that some of the pits could be natural, or that some man-made pits in the vincinity have been mistaken for natural features. The enclosure is situated on a gently sloping N-S aligned spur of land to the south of the river Avon. Other possibly associated monuments in the vicinity include a possible barrow cemetery immediately to the north west (NMR Monument 1002033 ), Marden Henge, Hatfield Barrow and another unusual monument (NMR Monuments 215179, 215176,215182) are further to the north west across the river. 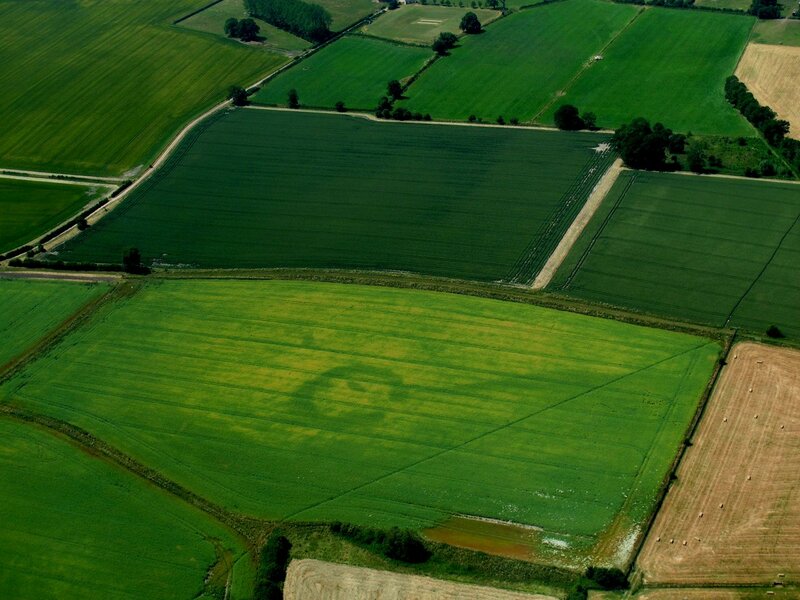 A possible Bronze Age round barrow is visible as cropmarks on aerial photographs. It is defined by a ring ditch measuring 42m across. It is part of a barrow cemetery and is situated adjacent to a possible mortuary enclosure and close to a possible henge (NMR Monument 1002029). The barrow is situated on a gently sloping N-S aligned spur of land to the south of the river Avon. Authors Linford P K, Payne A W, Linford N T.
A Neolithic henge (Goddard's Beechingstoke 1a), is located within the southern end of the Hatfield enclosure (Marden Henge NMR UID 215179), just north of the River Avon. 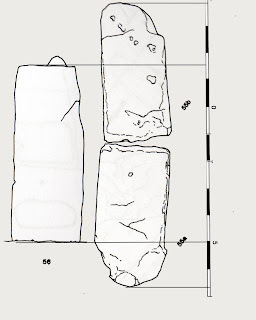 Excavation by English Heritage in 2010 confirmed the Neolithic date. These excavations revealed a well-preserved Neolithic chalk surface, or floor, within the henge bank. The central part was sunk into the ground, and had a large hearth surrounded by a gully. Outside the chalk surface, and further along the henge bank, there were middens, perhaps the remains of feasting debris. Finds included bone needles, awls and flint tools. The monument survives as a relatively well preserved and substantial earthwork, contrary to previous assertions. Hatfield barrow, now almost levelled, was described as being 70 to 80 yards in diameter and 50 feet high prior to 1818. 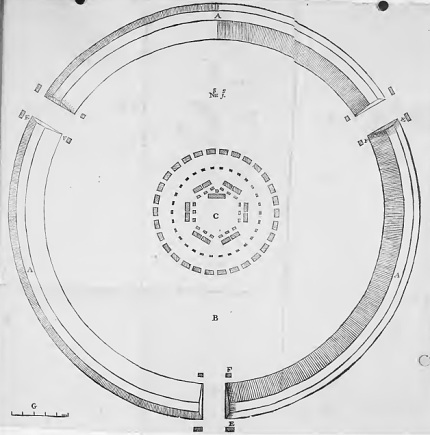 Excavations by Cunnington, described by Colt Hoare, in 1807 (when it was 22.5 feet high) recovered wood ashes, animal bones and two small deposits of human bones, perhaps representing secondary inhumations. Cunnington's excavations culminated in the spectacular collapse of the 'Giant of Marden'. Ploughing in the mid nineteenth century ensured there was apparently no trace left of the barrow by the 1860s. The barrow appears on aerial photographs to survive as very low mound sitting in a shallow scoop, which extends farther on the eastern side and is possibly partially surrounded by a ditch. 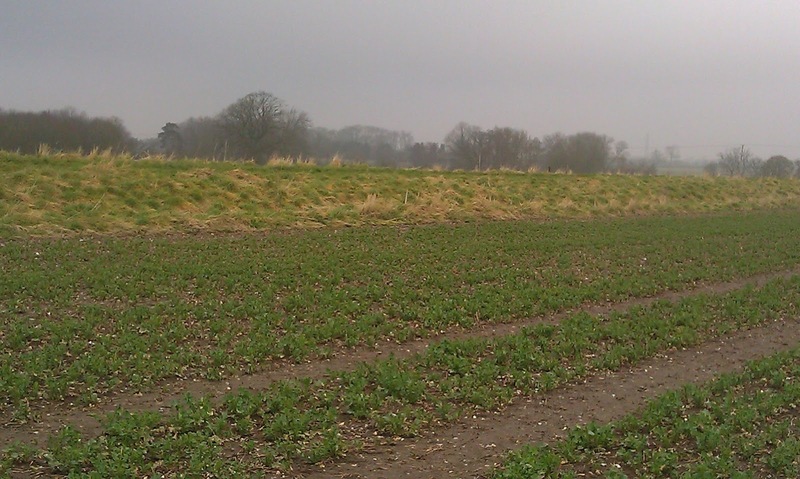 Field investigation in 2009 confirmed the survival of a low spread mound much disturbed by ploughing. Aerial photographs taken in 1976 suggest the survival of sub-surface remains of an asymmetric site about 75m across, comprising a mound c.55m across enclosed by a broad ditch or hollow. Geophysical survey in 2009 confirmed this. Excavation by English Heritage in 2010 identified a central posthole and evidence for tree clearance . The barrow was listed by Grinsell and Goddard as Beechingstoke 1. 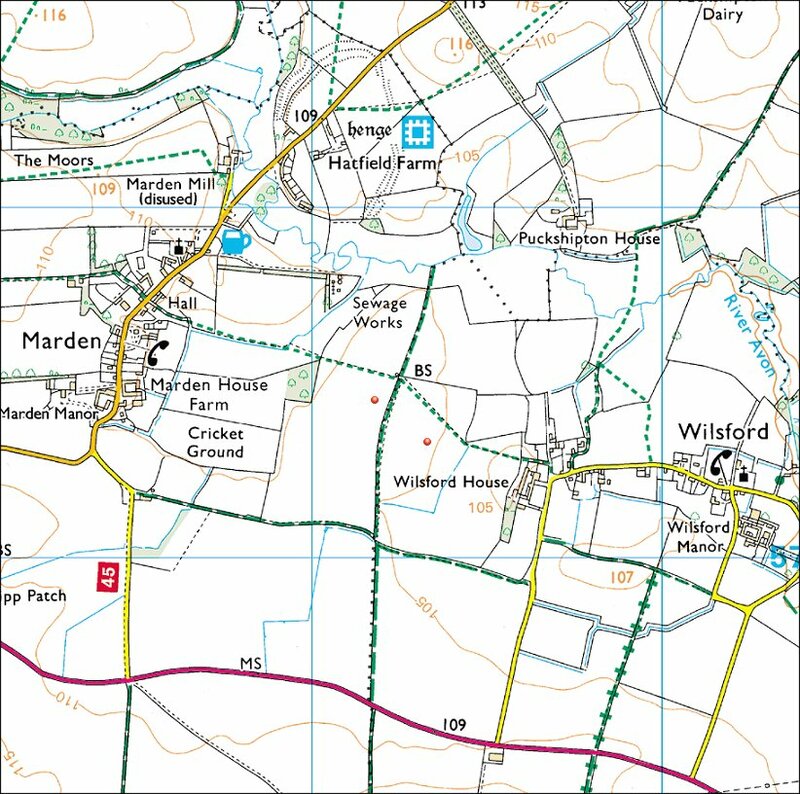 The barrow, and a small henge (NMR UID 215182) sit within Marden Henge (NMR UID 215179). Marden Henge is one of the largest Neolithic henges in the British Isles. The enclosure, comprising a bank with internal ditch encompasses an area of around 35 acres. There are no surviving stone settings. The earthworks are irregular, and consist of a series of straight lengths. These are broken by two causeways or entrances, to the north and east, although the latter has now been questioned, and a separate one proposed in the south east. In 1768, during levelling of part of the bank, antlers and a human skeleton were found. Excavations by Wainright in 1969 identified Neolithic remains including antler picks, flintwork, and the skeleton of a young female near the north entrance, as well as a possible circular timber structure. Excavation in 2010 by English Heritage through the southern henge enclosure ditch indicated it was 2 metres deep, and contained pottery, antler picks and flint tools. A thick deposit of gravel was recorded on top of the causeway to the south. Coring indicates that the gravel continues, probably part of a Neolithic gravel road way leading from the henge to the River Avon. 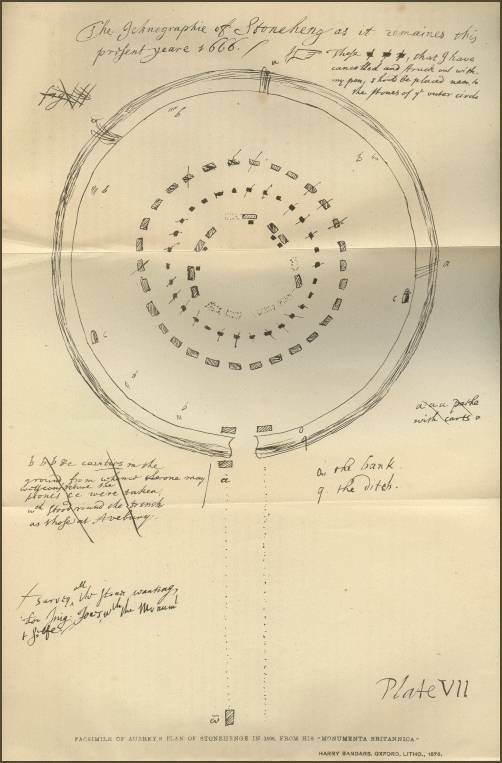 There was once a large conical mound near the centre of the henge, known as the Hatfield Barrow (NMR 215176). There is a small henge inside the southern boundary of Marden Henge (NMR 215182). These two monuments were also partly excavated in 2010 by English Heritage. The cropmarks of 15 closely spaced Bronze Age ring ditches are visible on aerial photographs taken in 1959 and 1972. A Possible 16th barrow is recorded as a slight earthwork on lidar (airbourne laser scanning) imagery. 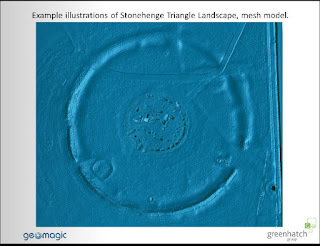 Two of the barrows identified as cropmarks can also be seen as slight mounds on lidar. 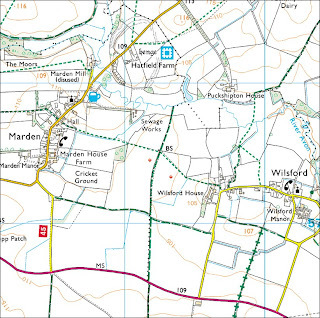 These are situated to the south of the river Avon between Wilsford and Charlton, 2km south-east of Marden henge. The ring ditches range in diameter from 19m to 55m and two of the barrows are double-ditched, suggesting a phased development. Three ring ditches extend into the field to the north where they are obscured by the earthworks of post-medieval water meadows. A fourth ring ditch has been partially destroyed by the course of the river. The ditches of the south-western barrows are incorporated into the possible Iron Age or Roman settlement enclosures, within which is a Roman villa (see NMR 907086). The ring ditches and barrow are recorded individually in the following records: NMR 1482559, 1482570, 1482572, 1482575, 1482576, 1482587, 1482592, 1482593, 1482611, 1482614, 1482619, 1482620, 1482624, 1482625 and 1482627. From the excellent Stonehenge and Avebury The World Heritage Site by Rodney Legg. Traces of the railway can still be found across the landscape from the Water tower at Druid's Lodge to the track that the path from the A345 to Larkhill follows. 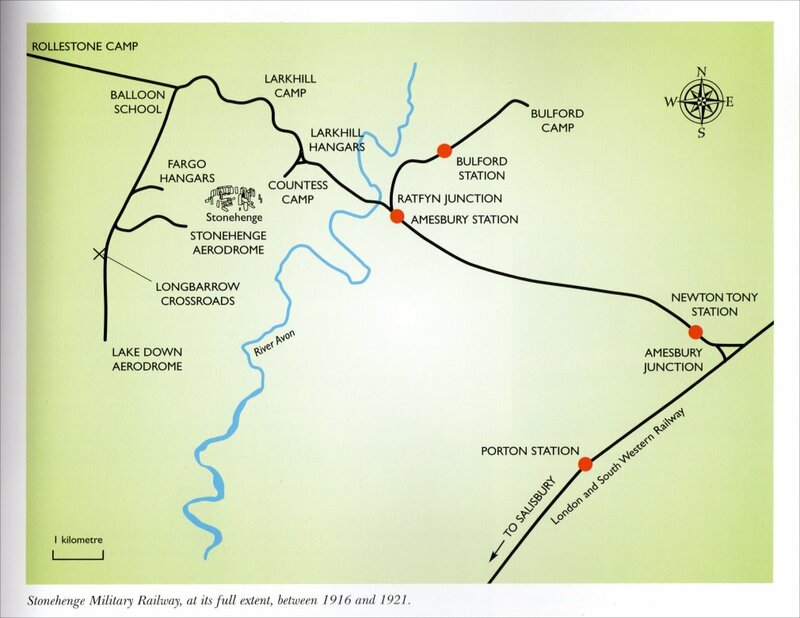 It is almost as though relaying it would have provided an excellent Visitor Transit System for Stonehenge, especially if the branch to what was the old Aerodrome had been included for trains to carry tourists across the landscape.to within walking distance of the Stones. And they could have returned from a stop at Fargo plantation. As far as I know the only extant neolithic posthole with a large wooden post still in it we have seen is that at Seahenge. 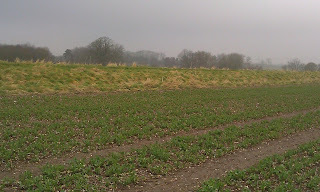 The central posthole was surrounded by a timber fence that was also still there, as are other ones such as at Holme II. And the main feature of this posthole was that the hole contained an inverted tree. In an idle moment I wondered what Woodhenge would have looked like if it had consisted of a magical upside down tree copse. I rather like it or I think I would have liked it. I have just read the 2004 book Stonehenge and Avebury The World Heritage Site by Rodney Legg which makes the same suggestion. Apologies to Rodney that I hadn't spotted his prior suggestion. Archeologists have found that the original Stonehenge was a graveyard for a community of elite families built 500 years earlier than the site we know today. 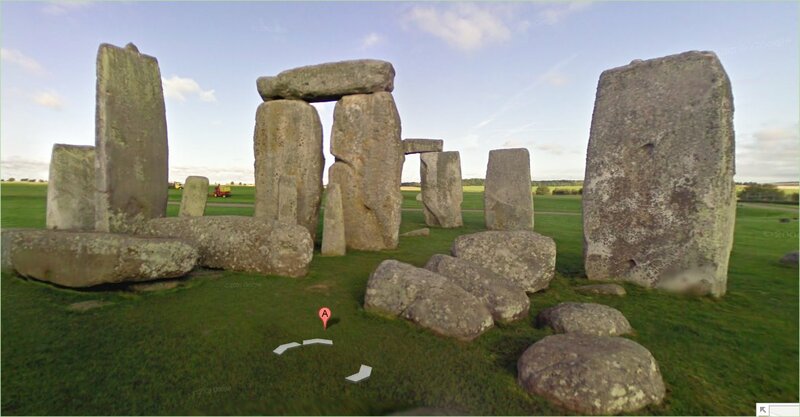 The new discovery has finally solved many of the mysteries surrounding Stonehenge, overturning the accepted view on construction and use of our greatest prehistoric monument. These new findings will be revealed for the first time in a special Channel 4 documentary screened on Sunday night (8pm 10 March). The British team, which was led by Professor Parker Pearson (UCL Institute of Archeology), analysed the ancient remains of 63 bodies buried around Stonehenge, finding that the first monument was originally a graveyard for a community of elite families, whose remains were brought to Stonehenge and buried over a period of more than 200 years. By testing cattle teeth from 80,000 animal bones excavated from the Stonehenge complex, the team also found that around 2500 BC it was once the site of vast communal feasts attended by perhaps up to a tenth of the British population, with people coming from as far afield as highland Scotland to celebrate the solstice. The film reveals that the animals were slaughtered in the Winter, nine months after their spring birth, pointing to the Mid-Winter Solstice gatherings at Stonehenge being a time for feasting on an unprecedented scale. For years the reasons for Stonehenge’s location have also remained a mystery, but the team now think that the site was chosen because of a pair of naturally-occurring parallel ridges in the landscape – the result of Ice Age meltwater - which coincidentally point directly at the Mid-Winter sunset in one direction and the Mid-Summer sunrise in the other. To our ancestors, this must have seemed an uncanny and auspicious sign – and we now know that they chose to build their cemetery at the end of them. Once completed, Stonehenge declined after two centuries. For years, this decline has been a mystery. But Professor Parker Pearson believes that it is explained by the culture of the ‘Beaker People’, known to have arrived in these isles around this time. He believes that their greater individualism and new material goods, including the first metal goods seen in Britain, put an end to the communal culture for which the monument had originally been created. ..Research is revealing that an earlier Stonehenge may have served a quite different purpose. A scientist says that the stones were in fact a graveyard for members of a prehistoric aristocracy who chose the site on Salisbury Plain because of an “extraordinary cosmological coincidence”. ...For most of the past century it was believed that the Aubrey Holes either once held giant wooden posts or were simply pits that were dug and filled in. Professor Parker Pearson was given permission by English Heritage to exhume the charred bone fragments and analyse them. He uncovered a “50,000-piece prehistoric jigsaw puzzle”. By counting the number of ear bones, researchers were able to identify the remains of 65 people. He believes these were of members of “elite” families from across Britain, interred at Stonehenge over a period of 200 years. The theory challenges the previously held belief that the bluestones were brought from the Preseli Hills in West Wales about 4,500 years ago, when the Stonehenge we see today was being erected. In fact, they formed an earlier monument on a site he believes was chosen because of a bizarre natural feature: parallel gullies carved into the chalk hillside by melt water at the end of the last Ice Age. By what he describes as “extraordinary cosmological coincidence” the stripes in the landscape point directly to the spot on the horizon where the Sun rises in midwinter. Meanwhile, archaeologists from the Stonehenge Riverside Project, led by Professor Parker Pearson, were studying 80,000 animal bones excavated from the site of the largest neolithic settlement in northwest Europe, at Durrington Walls, three miles from Stonehenge. About 4,500 years ago the encampment was home to 4,000 people at a time when most people lived in settlements of no more than a few dozen. It was at this time that the giant standing stones, weighing up to 40 tonnes each, were dragged 20 miles from the Marlborough Downs, while the bluestones were relocated to the inner circle. Each monolith was shaped by pounding with round stones, an almost unimaginably arduous task. By studying isotopes in the enamel of the teeth of cattle and pigs excavated at Durrington Walls, researchers were able to establish that the animals had come from all over Britain. Tests established that most were slaughtered in winter, during a time of what must have been prodigious feasting. catastrophe took place at any rate before the year 1574.
angle—was restored to an upright position in the year 1901.
before the Society of Antiquaries on 19th December, 1901.
made an independent examination of the position before stone No. were obtained by an entirely different method. shewn on the same plan between the other pairs of trilithon stones. be just about 10 ft. 6 in. level of all the uprights of all the trilithons is about 7ft. 6 in. With stones 7 ft. 0in. wide . space 3 ft. 6 in. ,, ,, 7 ft. 6 in. wide . space 3 ft. 0 in. With stones 7 ft. 0 in. wide . space 3 ft. o in. ,, ,, 7 ft. 6 in. wide . space 2 ft. 6 in. great trilithon, as originally erected, was not less than 2 ft. 6 in. and not greater than 3 ft. 6 in. further remarks on this subject see Chapter VII, pp. 133 and 134. At 6 inches above ground . 7ft. 0 1/2 in. At 7 ft. 6 in. above ground . 7ft. 0 3/4 in. Greenhatch who performed the 3d Laser Scan on Stonehenge have an informative website about the process which includes a fly through, technical details and a presentation. The presentation includes some stunning pictures such as these, so I can recommend a visit. 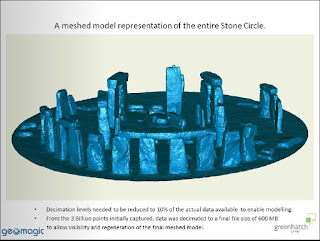 Open Access for Stonehenge on the Spring Equinox 2013 is expected to be on the 20th of March 2013. Expect a short period of access, from approximately 5.45am to 8.30am. The spring equinox access is a small peaceful gathering without facilities, parking is not available in the Stonehenge Car Park. More details as they become available. Stone 55 - Putting The Record Straight. 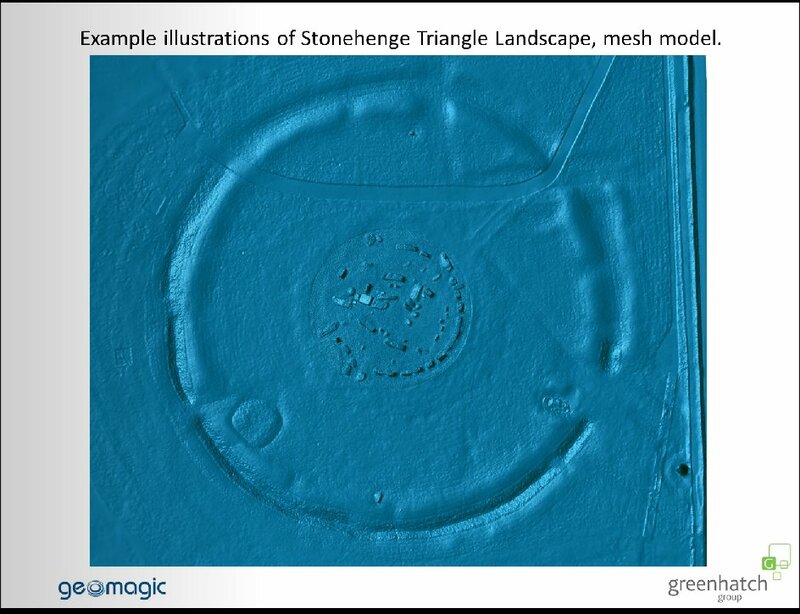 Cleal et al's Stonehenge in Its Landscape: 20th Century Excavations (English Heritage Archaeological Report) seems to have a couple of mistakes with regards to Stone 55. Stone 55 is the fallen upright of the Great Trilithon and 56 the straightened upright one. 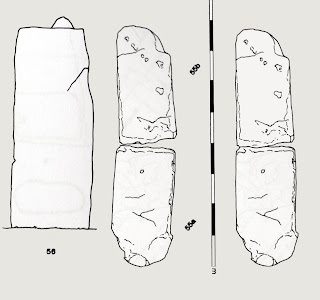 Firstly Cleal has on page 569 a scaled drawing of the stone from a 1919 Ministry of Works survey, on p.568 it has to the same scale a drawing of Stone 56. I have set the base of 55 into the ground to the depth of the stonehole excavated by Gowland, more on that below. The stone is obviously too tall to be part of a pair with 56. To check the drawing Simon Banton and I measured the stone on 4th March 2013. 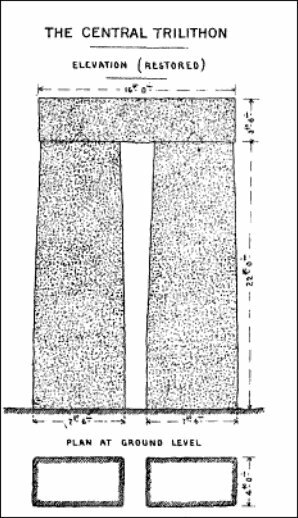 From the base of the stone to the top of the bulbous foot was 4' 3"; to the top of 55a (again as with all these measurement from the base) 13' 7"; to the base of 55b 14' 9" and to the top of 55b 27' 2" (8.28m). These measurements have some small margin of error as the tape measure was held off the stone and the choice of points was subjective, but they are the most accurate measurements for the stone I can find. 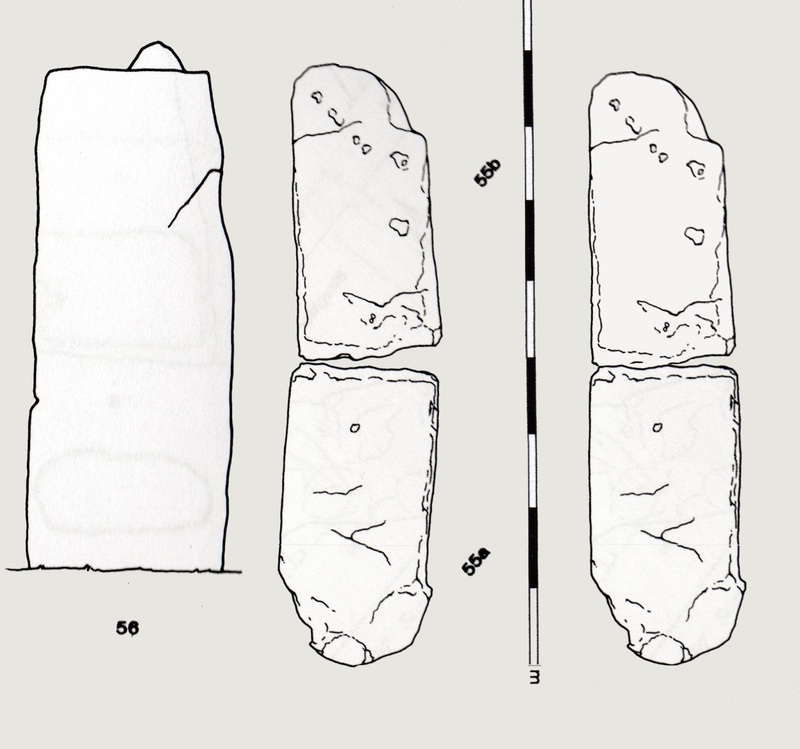 By rescaling the image (by about 75%) I have produced a more accurate scaled drawing, and by subtracting the gap and straightening the image a reconstruction of the original stone. The stone now fits as part of the Great Trilithon. It is also notable that it has not lost any of its length apart from the tenon and some rounding of the corners. Looking closely at the top of the stone it seems that the oval of the base of the tenon is still visible, it maybe that the Laser Scan can confirm this. 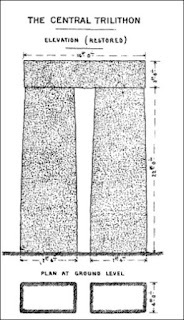 William Stukeley in 1740 published his detailed account of Stonehenge which included an engraving of Stone 55 showing the tenon still in place. A recent picture taken from Google Streetview shows that the stone is still in the same place, extending the same distance over the Altar Stone. This confirms it is still the same length. Of course the height of the stone depends on how far it is buried into the ground and this where a second mistake has crept in. Here is the passage from Cleal and the Figure 12 referred to from Gowland's report. The vertical scale in Gowland's diagram is in 6 inch increments (150mm). Cleal says that the hole is barely 2 feet deep (ie four 6 inch increments). This is the measurement from the underside of the fallen stone to the bottom of the hole. But the stone is sunk into the ground. On the left can be seen the ground surface level. 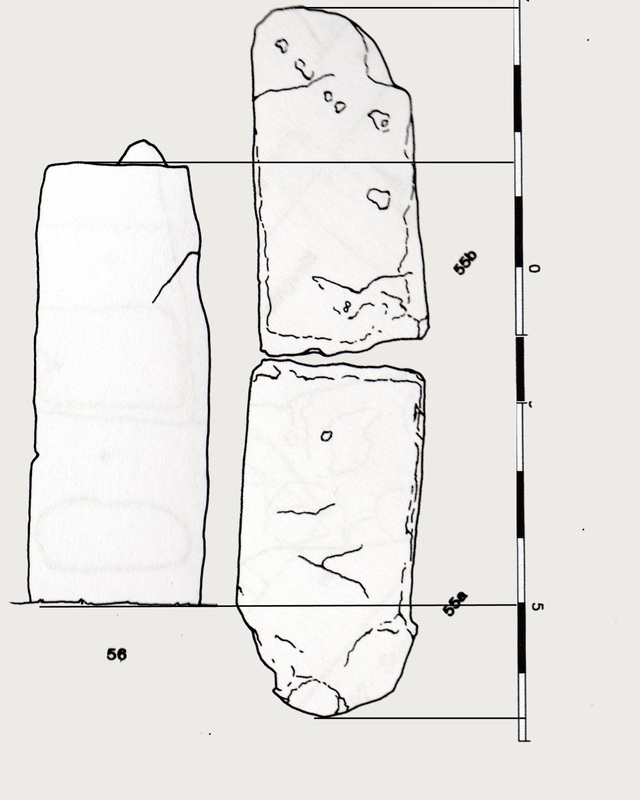 One can only estimate the the ground surface when the stone was upright but it is probably close to the level marked. This would give a hole depth of about 4' or 8 of Gowland's marks. The bulbous base of 55 is also about 4' from the worked flat side to its base indicating that this is the depth it probably was in the ground. Gowland's hole fits perfectly. The cut in front is probably part of the very ancient pit (WA 2448/3773) that was dug in front of the Trilithon for reasons unknown. For more on the pit see The Age of Stonehenge - Mike Parker Pearson et al. It is not clear how deep and far under Stone 55a Gowland excavated and if the illustrated cut extends under the stone or is the end view of the western edge of it. In conclusion, Stone 55 is largely complete but broken lying across its original hole which was about 4 feet deep. The hole was saucer shaped and when the stone fell the bulbous end rose up and slid backwards out of the hole. The weights and volumes are of the visible portion so we can guesstimate that there is a third or so more of the stone underground. To be generous to allow for the above portion of the stones being eroded let us double the weights. The heaviest stone is at most four tonnes, most are much less. Atkinson in his book Stonehenge (1956) p99 writes that the stones weighed "up to four tons apiece". But somehow the idea that the stones weighed five to eight tonnes became common. It is importnat because moving a two, three or even four tonne rock is a very different order of difficulty to moving an eight tonne one. 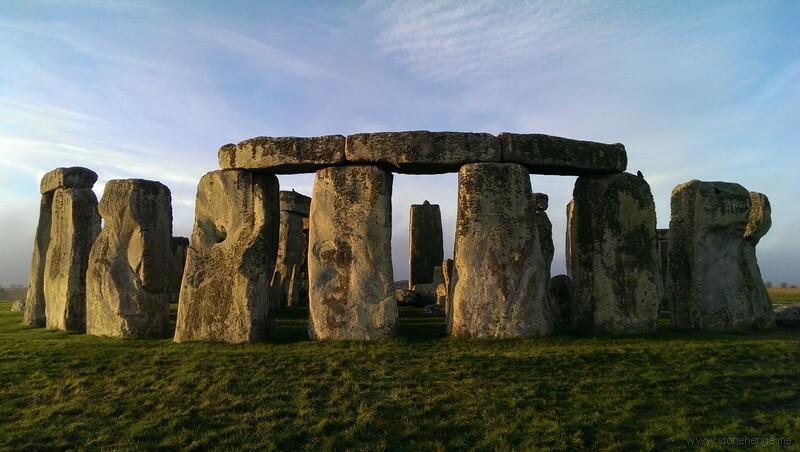 How Many Stones Are There At Stonehenge? There are 93 rocks or lumps of stone visible at Stonehenge now - not counting the buried and missing ones. All the stones are numbered on standard plans, see below. Note, if a numbered stone is broken and two separate bits or fragments of it are visible then it counts as two stones etc. I have checked this on the ground, but errors may remain, please comment if you spot any. Stone 40g is not counted because all that is visible is a lead cap. How many stones did Stonehenge originally have is a different question. There are five Sarsen Trilithons which gives fifteen large Sarsen stones. 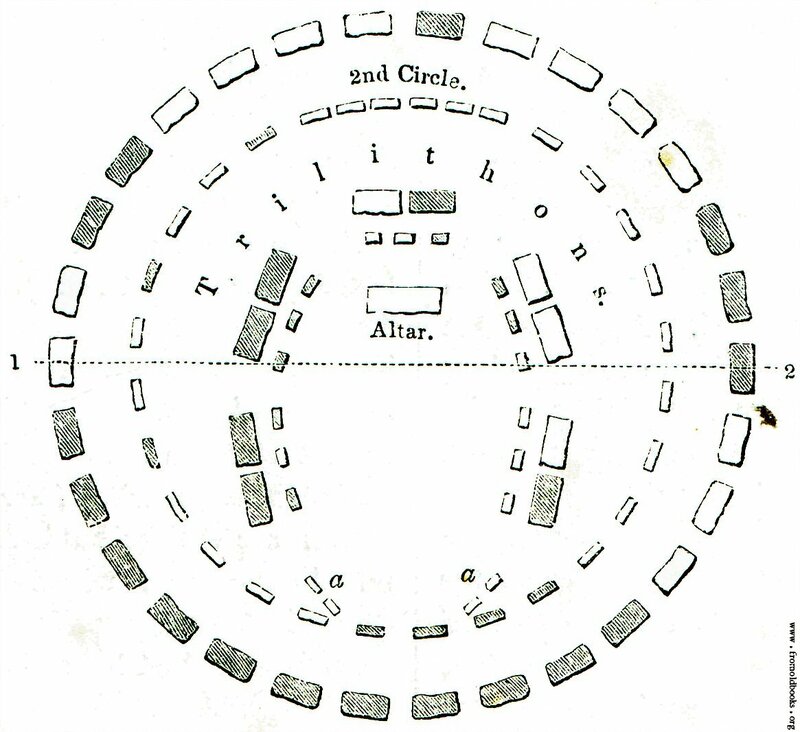 The outer ring of Sarsens is planned to contain thirty uprights and thirty lintels so that is 75 worked sarsens in total. There are four sarsens outside the centre, the two Station Stones, the Slaughter Stone and the Heel Stone. There are stoneholes for other stones matching these, another two station stones, a matching Slaughter Stone and a paired hole to the Heel Stone. (There are other holes such as the F,G and H holes which maybe were stoneholes.) These empty holes may have held other stones or maybe stones that were then moved, for instance the Heel Stone may have originally occupied Stonehole 97. So that is between five and ten other sarsens. There is the Altar Stone, origin unknown. And lots of bluestones and bluestone holes. There are 29 bluestones that are still visible, but the original number is probably around 80. They have been shuffled around the holes so it is hard to be sure but that is a reasonable estimate. So Stonehenge may have had up to 165 stones originally. It also had a vast number of stone fragments and hammerstones used for packing. 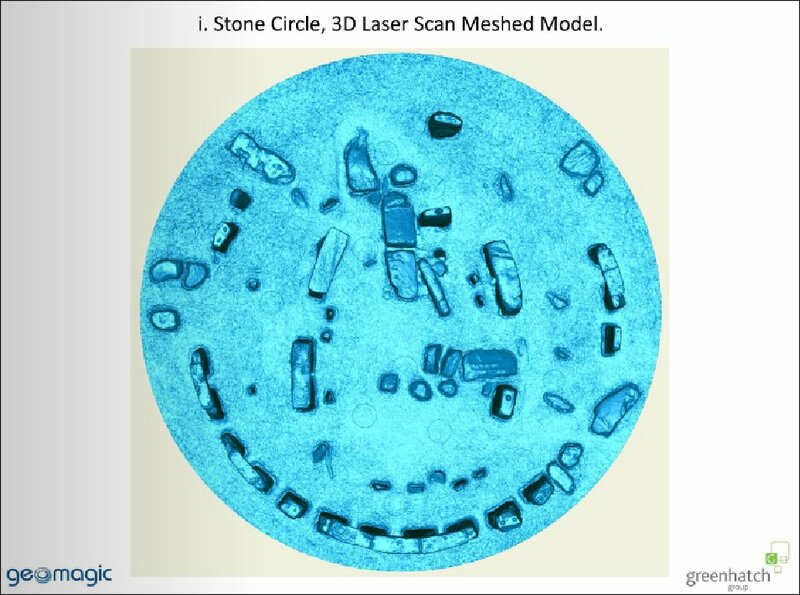 Where are the missing stones from Stonehenge? There is broken up bluestone, known as debitage, all over the site. Is this from stones being broken up for tools and talismen or is it the remains of shaping the stones? We know bits have been knocked off the edges of stones, greatly reducing them in some cases but complete stones carted off for use elsewhere have not been found despite searches. So it is another Stonehenge mystery.